Although sailing into the Baltic provides an opportunity to visit Stockholm, we thought we’d fly there in the event our route changed (which it’s be known to do). So, on a Wednesday morning we took an easy flight to Sweden’s capital, one of which we’ve heard many favorable reviews. A photo pulled from the Internet gives you an idea of how lovely this cityscape is. 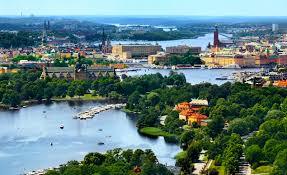 With its 14 islands and over 50 bridges, Stockholm offers an abundance of both natural and manmade sites to explore. Tossing our backpacks in the apartment we walked around the corner to provision for a few days. Surprisingly we discovered the prices for groceries seemed in line with what we’d been paying in Hoorn. What a relief as it made shopping a pleasant task versus one where you’re constantly picking up an item only to place it carefully back on the shelf in search of a different (read “cheaper”) option. Over dinner we laid out a tentative plan for seeing key sites during our week stay, beginning with one of the main attractions: the VASA. The next morning the sun shone and the temps were brisk but not cold. Armed with our Travel Card we hopped on a bus, then tram and found ourselves on Djurgarden, one of the 15 islands that comprise Stockholm. This island offers multiple museums, one being Skansen, the world’s first open-air museum. Unfortunately, we had read it was closed for the winter; but, two other museums more than made up for not visiting Skansen, the first being the Vasamuseet or VASA Museum that houses the original 1628 War Ship built for King Gustav II Adolf. You’d think with such a major site the path to the museum would be clearly marked, but it’s not. After a few times of retracing our steps and asking some high school kids, we managed to arrive at the entrance. and, here’s a cut-away diagram that shows the levels. The cause? The VASA simply was too tall, too narrow, and not enough ballast (weight) in its bottom despite 120 tons of stones. The 60+ brass guns didn’t help, either. There was an inquiry but no one was blamed probably due to the original shipbuilder having died during the first year of construction and the second one simply saying he was following the first builder’s plans. Plus, the king had signed off on the plans adding a second gun level and, thus, more imbalanced weight; but, I don’t know if I would have reminded the king of that fact. The ship’s name comes from Gustav II Adolph’s family’s 14th century symbol: a sheaf of wheat. Here he is in a portrait dressed as the roman emperor Augustus, the Caesar of peace. Monarchs likened themselves to those Roman rulers of old; and, for the Swedish Kings, it also poked at the German Emperor, part of the Holy Roman Empire. Although, I must say grown men dressed like this for a formal portrait brings to mind a great Halloween costume versus an impressive dynasty. He commissioned the VASA in early 1620s and building began. Four hundred men within three years built this floating battleship. At over 173 feet tall, 39 feet wide and 100 feet long, this baby is BIG. Evidently, the captain supervising the construction demonstrated the VASA’s instability to the Admiral by having 30 men run to and fro on the upper deck. And, yup, the ship could easily capsize. Unfortunately Gustav wasn’t available for this exercise as he was leading the army in Poland and impatiently waiting for this ship to arrive. And, like many reporting to such a leader it’s easier to be a yes-man than to deny the more powerful person his gratification, especially if that powerful person’s nickname is “Lion of the North”. So, the VASA was set free on August 10th, 1628 with all the pomp and ceremony one would expect. Brightly painted sculptures adorned the hull and bowsprit with red figuring prominently as a small model shows. The decor implies the righteous power of the king to defend the country and the Christian faith. Hard not to be impressed when you see this thing moving under full sail. Yet, imagine if you’re one of the lucky ones to set sail on this inaugural voyage. Pretty cool, eh? The cannons fired celebratory shots and the hooping and hollering must have been deafening as she proudly left the dock. Then think of how your stomach might lurch when a gust of wind tilted this top-heavy ship to one side followed by the surge of relief when she righted herself and continued on its way. But, now a second, stronger burst of wind hits the sails and the deck tips enough where you know in your gut that this thing ain’t coming back up straight and level. That’s when I’d be thinking not too happy thoughts as my feet start sliding and screams begin hurtling around the ship. On August 10, 1628 that’s what happened.The VASA sank with water flooding through its gun ports. What had begun as a monument to Swedish power settled in 100 feet of water at the bottom of the harbor. At least thirty lives were lost with over 100 being saved; yet, records at the time aren’t clear on how many were actually aboard and how many drowned so take those numbers with a grain of salt. the other a joint letter to the king (Erik Jonsson was a Vice Admiral and the Squadron commander). Seven floors comprise the exhibit, which begins with an informative movie. Immediately following the film a guided tour provides useful background for one’s wandering up and down the various levels. and even food they’d eat based on a pewter crock’s remnants of butter. And, of course, the bones provided information on individual’s genetic make-up, including an unusual skull deformity of unfused foreheads shared by two women and a man (you can just make it out on the skull below). coupled with the women also having a bulge at the base of the skull, a rare inherited trait. But, how did the VASA ever get found? It’s thanks to the persistence of a private researcher, Anders Franzen, who knew the brackish waters of the Baltic served as a determent to the nasty, wood-eating shipworm who lived in saltier seas. Another factor providing a helping hand in preserving the VASA was the polluted waters in which she was found. Years of dumping waste in the harbor produced hydrogen sulphide as debris rots consuming oxygen; and, waters low in oxygen meant some wood-attacking creatures found it difficult to survive. resulted in not only the pleasure one gets from seeing the VASA but also pioneered methods that assisted in preserving other wooden ships, such as the MARY ROSE on display in Portsmouth, England. It’s an onging challenge to maintain this relic. Humidity caused by thousands of visitors resulted in harmful sulphur and iron deposits on the ship’s surface… the 1960s bolts used to hold her together have begun rusting (they’re in the process of replacing all 5,300 of them with stainless steel versions)… and VASA’s 800-900 ton weight (as much as six jumbo jets) twists the hull 1 millimeter per year. Those problems are all being addressed but it’s only through constant surveillance that the VASA can hopefully remain as a wonder for others to exclaim and learn about. This entry was posted in 2017 03 SWEDEN - Stockholm, 2017 Winter Tours, COUNTRY, Europe, Sweden, WINTER TOURS and tagged Cafe, Museum, Vasa on April 10, 2017 by margaretlynnie.